The Alpstein 800 Down Sleeping Bag from Vaude is ready for the next ice age: Vaude's lightweight down sleeping bag is built for extreme alpine activities. 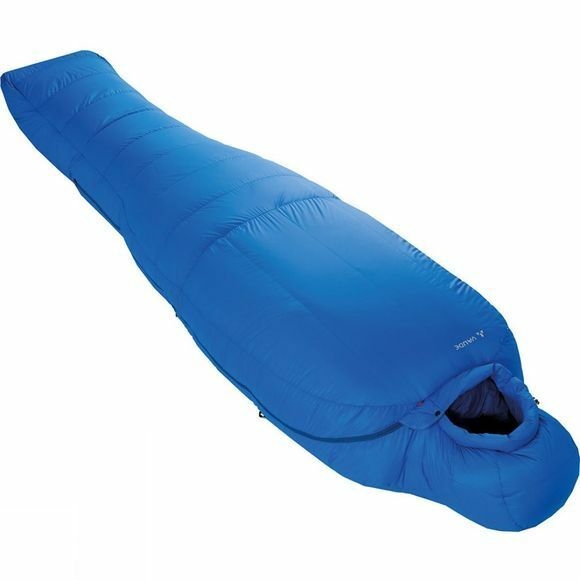 This expedition sleeping bag has a sophisticated V-chamber design and is filled with 800 grams of high-quality 800-fill power goose down obtained in accordance with the Responsible Down Standard (RDS). The bag's cut is optimized for alpine use. A thick thermal collar on the hood reduces heat exchange and efficiently prevents cold from penetrating the bag. A darker lining was used to accelerate drying in the sun. The Alpstein 800 DWN sleeping bag can be attached to an insulation pad to prevent it from getting twisted in the night or slipping off for improved thermal performance of the sleeping system. The textile materials are certified according to the bluesign standard. The Vaude Green Shape label stands for environmentally friendly, functional products made from sustainable materials.